I have long held the belief that writing a single review of an MMO beyond covering the question “Is it broken?” is largely pointless. Due to the nature of the genre, one person’s experience can and will differ vastly from any other persons. This is my second attempt to play Lotro and I am finding it remarkably different from the first time. The biggest contributor to this is the fact that I am playing a hobbit rather than a man, so consquently I am in a totally different zone. Well actually, lets go back to the beggining. When you first start a character, you are thrown into this linear instanced single player tutorial section which gets you going and provides a bit of action straight of the bat. This sequence had Black Riders hastling hobbits looking for Baginses and such things. Once you have learnt how to both click on things, and click on other different things, you are graduate to actually being able to play with other players. You find yourself in a non-instanced newbie area which is sectioned off from the rest of the game. Actually i was most disappointed to find that it was the same place that the humans go at this point so I had already played through it. At level 5 you run out of quests here, do a story mission, and then I was sent back to the Shire to start the proper game. 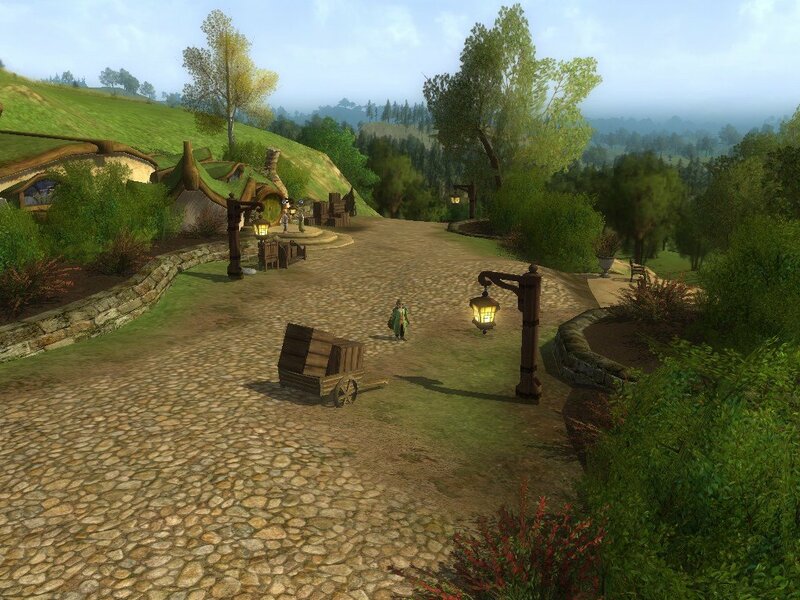 While Bree-land felt a bit sparse of quests and towns, there being a mere two before you ended up wandering into Bree, the shire is a sprawling mass of hobbit villages and seemingly endless quests. I think that for the proper Lord of the Rings related experience, it is definitely best to start as a Hobbit. It just seems the right place to start. You potter around doing relatively unimportant quests of no real consequence, which is appopriate to the ramp up that I know is coming later. You also get to see ‘famous landmarks’ like Bag End. Here’s a holiday snap. * The shire is beautifully constructed. It’s largely based on this marvellous piece of art which Tolkien seemingly doodled on the back of a napkin. All those villages are present. 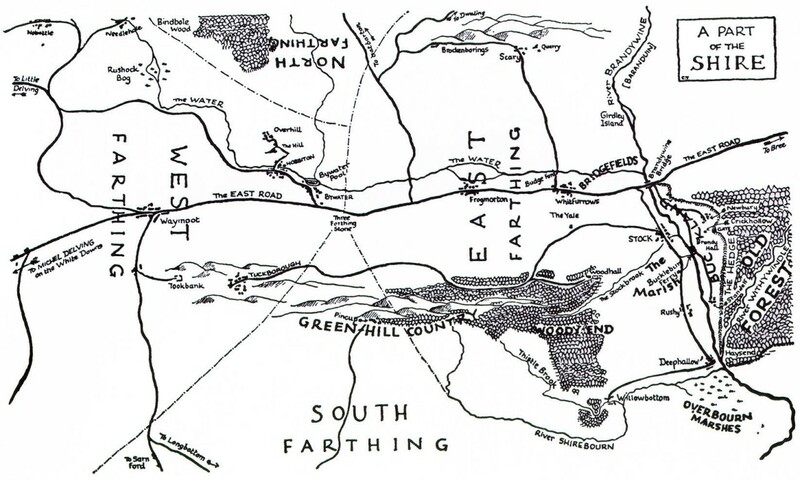 You start in Little Devling, and find Michel Delivng, Waymeet, Hobbiton, Bywater, Overhill, Needlehole, Tookborough, Brockborings, Scary, Frogmorton, Woodhall and Stock. Each village has a distinct look, and has a lot of content which is usually about 4-10 quests. * Playing a Minstrel. There is something oddly badass about whipping out a lute and playing chords as a bear comes charging at you. The minstrel is basically a healer/caster, but using a lute instead of magic. The reason for this is that characters in Lotro don’t have hit points, they have ‘morale’. Apparently the only effect of being gnawed by a bear is a slight loss of morale. Anyway, the minstrels little tunes boost morale which sort of makes sense, I guess. * There is some pretty blatant attempts to waste the players time going on. There are these postal delivery and pie delivery quests. Both have the player trying to delivery post and pies between the various villages while avoiding hungry hobbits or nosey hobbits. Most of these quests take about 5-10 minutes of boring running from one town to another, and if you can mess up at the last second and have to start all over if you get too close to one of the hobbits. It’s rather aggravating really. * Group quests. Well I haven’t found many of these so far, but I’ve got one in my log that doesn’t look like it’s going anywhere any time soon. The server I am playing on seems a little dead and no-one seems to be around to do it. This is a problem I had with Wow as well. The only option really is to wait till I really outlevel it and come back later. I recently had this terrifying desire to play “Lord of the Rings Online: Shadows of Angmar” or Lotro as the kids on the streets are calling it. Frankly I am just glad it wasn’t a desire to play Wow again. I think I am scheduled to have one of those around whenever the Wrath of the Lich King expansion comes out. As I haven’t been finishing a lot of anime recently, and I find writing games reviews oddly hard and un-fun, I have decided to write some stuff about my experiences with Lotro until the time when I inevitably freak out and uninstall it forever. again. So yeah, Lotro was the first big MMO that had the misfortune to be released after Wow. Actually that’s probably a complete falacy but I can’t be botherd to check it up. It borrows a ton of stuff from Wow, which is probably a good thing as that game did so many things totally right. It’s good that I can just press the same buttons and have pretty much the same things happen. Lotro is of course set in everyone’s favourite Tolkien-esque fantasy world Middle Earth. Actually it’s only set in a bit of it. Middle Earth is big in the books, and while they could of compressed it bizarelly like Azeroth, they instead went the better of option of just making everything totally massive. 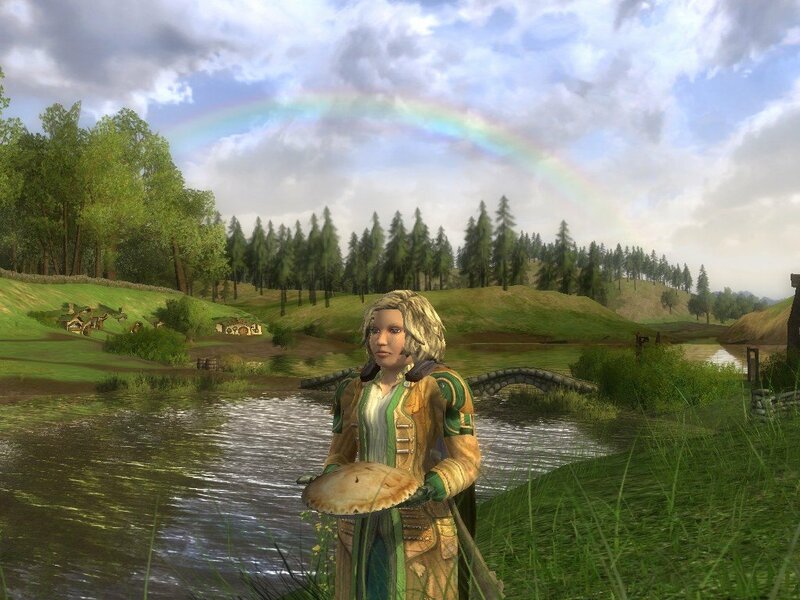 Lotro is currently set in the part that most people remember from the time they tried to read the book and gave up at the Tom Bombadil chapter. You’ve got The Shire, Breeland, Rivendell and various other places between there and the Misty Mountains that they probably either scraped from a single mention in an appendix, or just made up. One odd thing to note about it is that this is nothing to do with the Peter Jackson films, so it definitely doesn’t look exactly like them, but it’s still recognisibly middle earth and even seems to nudging you in the ribs trying to remind you of the films at times. Yeah, I played it when it first came out back in Jun 07 I think. Me and a couple of friends played it for a couple of months. A minstrel. Largely because I find the idea of bards and minstrels to be hilarious. I got to level 13 or so. What they lack in style compared to Wow they make up for in Bloom and technical fanciness. The water in this game looks most excellent. The game seems to of gained some fancy Direct X 10 features since I last played, though this might be just because I actually have a DX10 card now. There’s a slider for Bloom level in the Advanced Graphics options menu which I have slid all the way to max, because I find Bloom funny for some reason. I eventually freaked out when i could see it becoming the same time consuming monster that Wow is. Like, everything took to long, and I was going to have to be increasingly reliant on grouping with internet jerks to get things done which is something I could really do without. Funny for someone playing an MMO to think that really. Wait, why did you decide to start playing again? Oddly, the only original thing about Lotro is the thing that caused me to come back. The game has this thing called an ‘Epic Quest’, which is a quest chain that goes throughout the entire game. In it you are basically following the Fellowship in their quest and helping them out as they travel around doing the events from the book. The epic quest is structured into books which is split into about 10 chapters or quests. Some of these even have crazy cutscenes and stuff like Sauron’s eye will appear in your mini-map whenever you are near a rider. They’ve been releasing new books for free in patches which is awesome. I sort of wonder how far they’ll ever actually get through the story before the game dies for some reason. They are currently working their way through the second of the six volumes of the story. So are you starting over? I logged into my old character and discovered that I had totally forgotten how to play, or what I was doing, so I have decided to start over. I have created myself a Hobbit minstrel this time so I get a different starting area. I am not planning on playing it for much more than an hour a day. Though I’ll have to see how I do with that. I have no desire to lose my self to a bloody MMO again. So yeah, Lotro. I’ll do a proper log of what I’ve been doing when I have something to say.